It's a mall? It looks like an office park. It doesn't look like they are stuggling, according to their Website. They have some vacancies, but nothing major. Although, if Wal*Mart moved to town, this place would be an Indian bingo hall. "The mall from the outside appears healthy; however the stores inside that lack outside entrances are largely vacant or taken by non-traditional tenants". That's certainly never a good thing. The anchor on the left is supposed to be a store called Shaw's? It looks like a Sears logo to me. That next to last letter is definitely W, it was Shaw's. I hope to get to this mall someday soon for a Labelscar post. It's definitely kind of dead, but I haven't been since they added Peebles and Big Lots as anchors. I can't imagine these have changed things much, however. It's most definitely still open, but Belknap is (and always was) a pretty small mall. 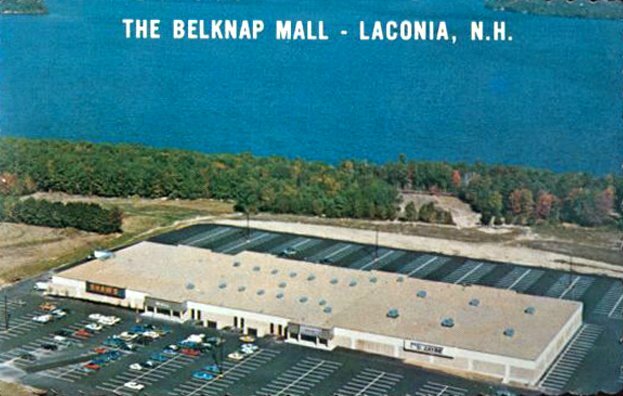 The opening of the larger Steeplegate Mall in Concord (a city that always was large enough to support a mall, unlike Laconia) probably didn't help Belknap at all. this mall used to be almost dead but within the last year they have added so many stores. like a verizon wireless, and ice cream store with ice cream to die for. they just recently brought in quiznos.they also just put in a clothing store called maurices that actually has decent womens clothing and the marketing events sre great. it has gotten so much more lively within the past year.